AUTOMATIC ARM RESTRAINT: Provides easy positioning of arms up to 200mm height. 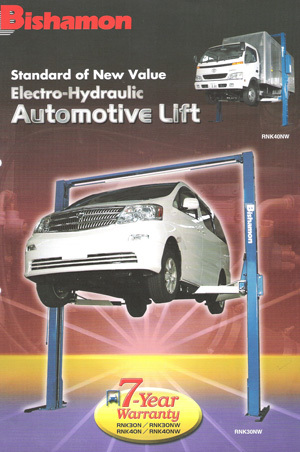 When the lift is raised over 200mm, arm restraint automatically engage. 1 LEVER CONTROL: 1 lever operates safely for both hook releasing and lowering. ROLLING EASY ARMS: Rollers mounted in Swing Arms provide easy and smooth setting of lifting point. BODY CONTACT PADS (Standard): Screw height adjustable. Standard pad has center groove for maximum contact. HYDRAULIC CYLINDER: Dual hydraulic cylinder system has automatic shut off valve for protection against hydraulic failure.